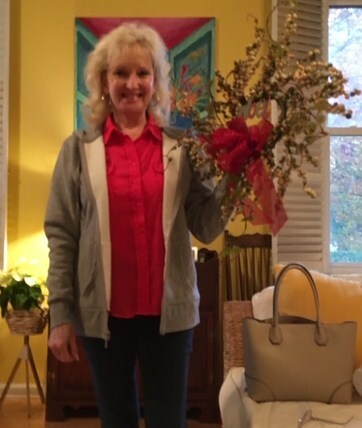 Besides my fingers doing the Christmas shopping this year on-line …my mind is trying to remember how I can pull old wreaths and left-over Christmas items from the past and put with other items around the house for a “new” look. With no car and a foot mobile restriction…finding items as physically close to me as possible is this year’s name of the game for Christmas. K.C. had taken me to Tuesday Morning after I got back from my appointment last Friday with Anne…to see about looking for a wreath. There it was, only the last day of November, and practically all the wreaths and other decorations were gone…I couldn’t believe it…really? And then Pinterest came through for me…a picture showed up of a rustic-looking piece of wall decor propped up against a wall with a wreath attached to it. It was gorgeous. Hummm…I had the wall decor from the other apartment but I didn’t have an extra wreath beside the two for the side doors that match. But something lead me over to the other side and deep inside a box in the closet was the wreath pictured above…it had been out in the garage for awhile and the birds had tried to eat the “fake” berries….but hey, why not? 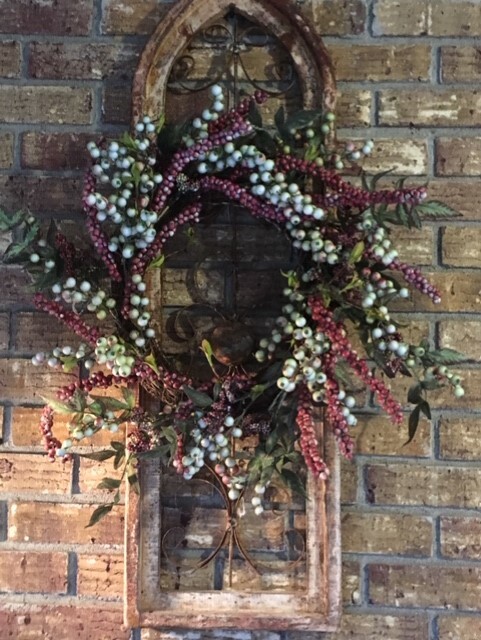 A “rustically used” wreath with a rustic wall hanger. It worked. K.C. and I looked and looked for a burgundy bow to spruce up the two green and cream berry wreaths without any luck. Then Sunday evening K.C. 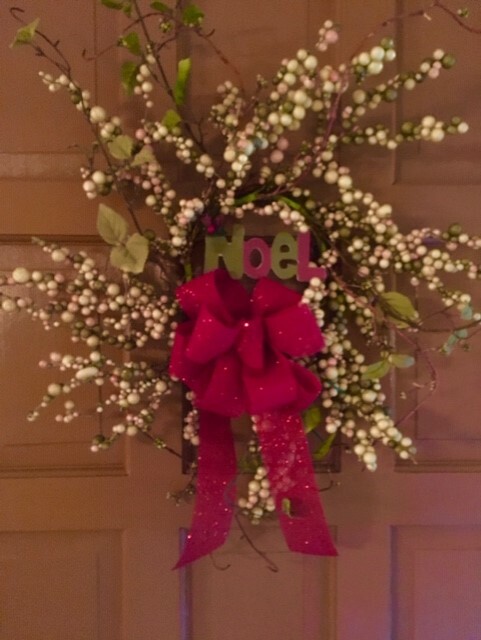 called all excited…she had gone in a Family Dollar Store and found just the right shade of burgundy ribbon to make two bows for the door wreaths and two small painted wooden signs (in burgundy and green) that spelled out Noel. Perfect! Beautiful bows, K.C.! It is such a wonderful feeling when old objects are brought back to life again…when something mundane is turned into something exquisite. And it is even more rewarding when we surprise “the pants off” someone with it! It should always be someone who can use a little unexpected delight! For the past three years I have left poinsettias on all my neighbors’ front porches on December 1 with a little anonymous jingle. This past Saturday was December 1 when Tommy, Mandy, and Eva Cate came to help me decorate for Christmas. 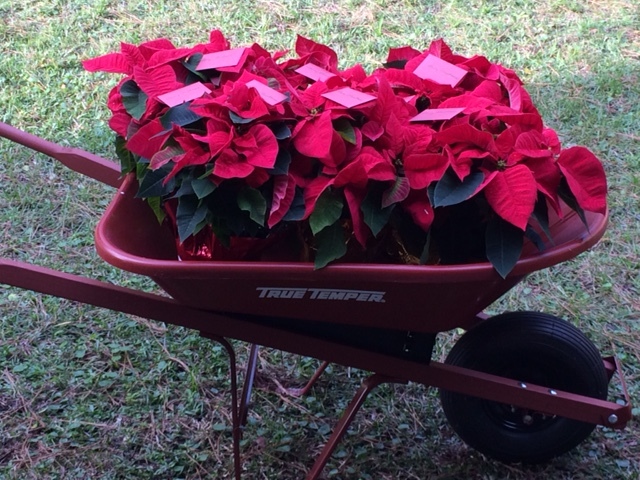 It made me sad that my wheelbarrow wasn’t filled with poinsettias as usual… I remembered that it took a couple of years before one neighbor caught me sneaking around and the word was out who the “poinsettia” person was. Still that was fun! Aren’t there so many people out there at Christmas time that could use a “shot of wonder, a bit of beautiful mystery” in a parcel left by the door? We need to put as much thought into the surprise gift as we do our children or grandchildren’s stockings. Maybe it could go to the quiet bus boy at your favorite restaurant, the tired looking sales clerk, the kind-hearted mailman/woman, or the sympathetic policeman who helps you understand the procedures of a theft. 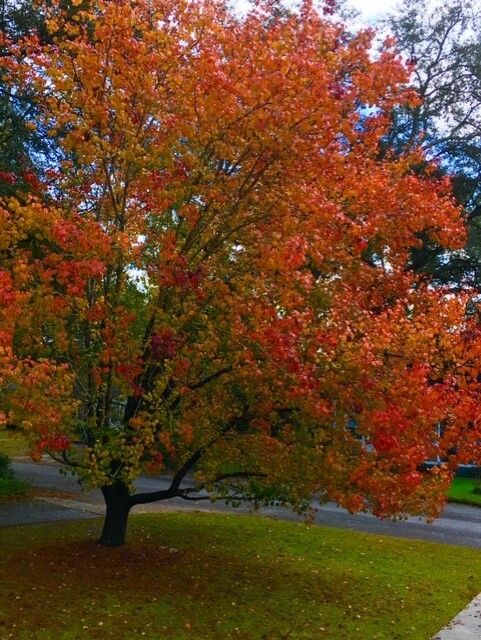 Nature is surprising me with my Bradford Pear! 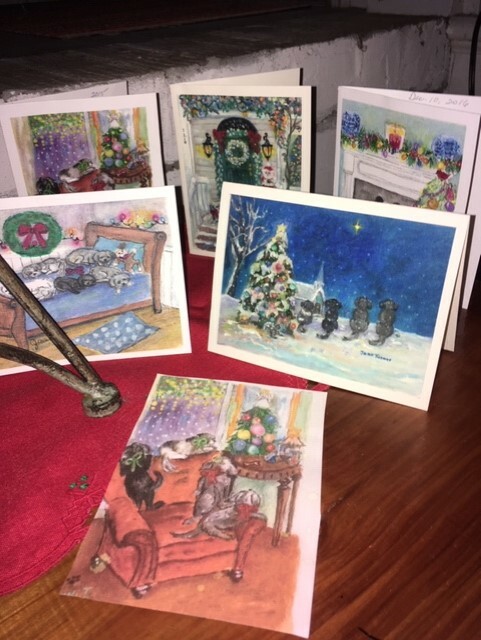 *I found several of Joan Turner’s original Christmas note card paintings and put them all together…the excitement is building…what will this year’s painting look like? Your wreath is just perfect. I like the idea of leaving a poinsettia for a friend. You are always thinking of others, and that is probably why you handle your problems so well. Your attitude about life reminds me of my Mother’s. One of her favorite hymns was “Others”, and the first verse went like this: “Lord help me live from day to day in such a self-forgetful way that even when I kneel to pray, my prayer shall be for others.” Thank you for all your messages, and I am hoping your foot will be much better by Christmas. Jo…I have never heard that hymn….but I love the lyrics. Now I am curious and will have to look it up! Perfect! Isn’t it true….if one “critter” doesn’t get into the Christmas decorations…another kind will…such is life.